A shop that had a wide stock or everything espcailly American imports and was requented a lot by Bill Wyman (Rolling Stones) in the early 60T's. This is just one of many shop the Stones are linked to as customers. (Aug 1, 2012) Neil Partrick said:This picture (from 12 years ago as it closed down?) suggests that it was/has become a second hand car show room! I share your memory of it from the late 70s. I last visited it in 1976 and it was a few albums ans sheet music, but mostly, very attractive, instruments. 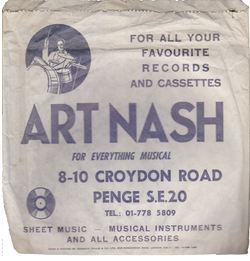 (Mar 15, 2012) Simon Lloyd said:I grew up in Penge in the 60s and I remember speaking to Bill Wyman outside Art Nash in about 1965 (I was 10). I used to buy records and sheet music there and I bought my first little guitar amplifier there. I remember there was an old Vox AC30 for people to try out electric guitars. It would be worth a fortune now. (Feb 20, 2012) jd said:The owner had a very nice daughter back in the '60's. ( March 8, 2016) While watching a recently-transferred colour cine film to VHS video with my brother-in-law, some local beat groups playing on a stage in the open air at the New Addington Carnival in the early 1960’s caught my eye. One of the groups I recognised as the Martin Jae Five (aka Group X) from photos I had seen in a recently published book called ‘Rockin’ and Around Croydon’ by Chris Groom (published by Wombeat in August 1998). 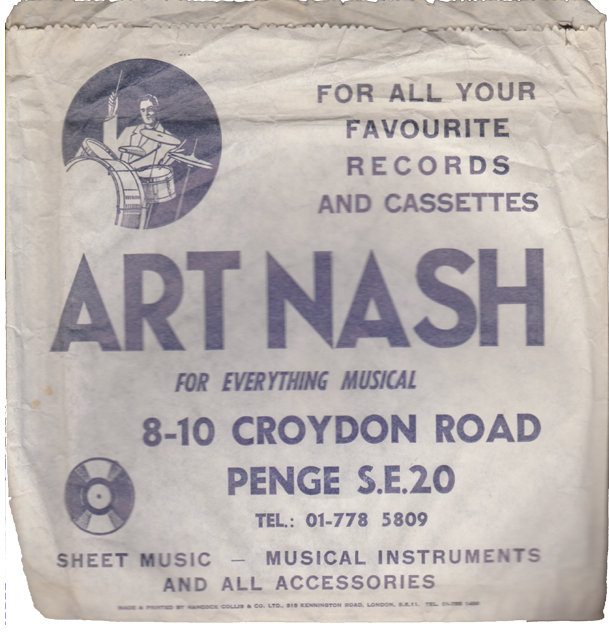 I had read in the book that Mick Hack, the lead guitarist, later became a record company sales rep, who called on Art Nash in Penge. The people who owned it were retiring at the time and Mick and his brother bought the shop. I telephoned Mick at the shop and arranged to deliver him a copy of the VHS tape. He was still in touch with the remaining members of the group, including Martin Jae (whose real name is Martin Nighy, brother of actor Bill Nighy). Before I left I had a browse through their CD racks and bought one by ‘The Flames’. The chapters on Martin Nighy and Mick Hack in Chris Groom’s book make fascinating reading. They formed the group while they were all employed by Dees (a Ford motor dealership in South Croydon), along with Dave Newton, who later worked at Potters Music Shop in Croydon. Jeff Beck worked at South Croydon Motors just down the road. They played gigs above the Pyramid record shop in Broad Green, Croydon and the Co-Op Hall at Peckham (where they played alternate weeks with the Dave Clark Five). What crazy times the sixties were! Dave Harwood. Art Nash in Penge,two weeks before closure in July 2000 photo Michael Viner.